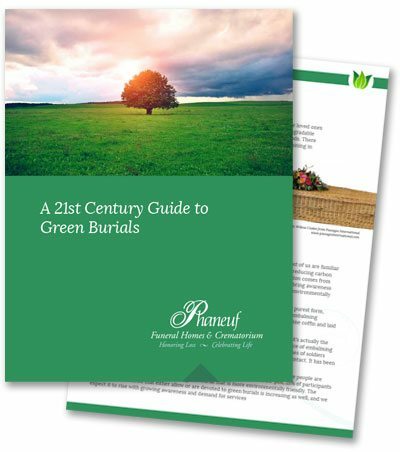 Thank you for downloading your free copy of A 21st Century Guide to Green Burials. We hope that you will find it to be a valuable resource for planning end-of-life arrangements for yourself or a loved one. While the book does contain a great deal of information, you may still have some questions when you’re done. If that’s the case, or if you find there were some things not fully covered in the book, please don’t hesitate to reach out to us. You may call (603) 625-5777 or 1-800-PHANEUF (742-6383) to talk to a member of our compassionate, friendly staff, or complete the contact form on our website and someone will call you. You may also find more information on green burial and end-of-life planning on the Phaneuf blog. You may browse the posts or use the search function to narrow the scope of your inquiry. If you are looking for information on pre-planning your end of life arrangements, you will find a great deal of information on the Pre-Planning page on our website. We also recommend subscribing to one of our newsletters. Each one has invaluable resources, information, and news that will help you in pre-planning, caregiving, dealing with death, facing a loss and much more. Subscribe here.